After a recent incident, the HSA have issued a safety alert, a person who carried out hot works on empty hazardous waste containers was killed due to residue being present in the container. The operator had been using an oxy/propane torch to cut up the tank. It exploded with such force that one end of the tank flew over a fence and into the premises next door. This tragedy has accelerated the need for insuring best practices for carrying out hot works in zoned areas where hazardous materials are stored. The aim of this article is to portray the importance of employing best practice when carrying out hot works in an environment where hazardous materials are present. Flammable liquids and vapours such as petrol, diesel, fuel oil, paints, solvents, glue lacquer and cleaning agents all can leave residue in the container in which they are stored. 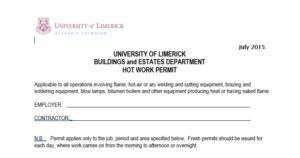 In accordance to University of Limerick guidelines emphasis and responsibility lies with the employer when obtaining a hot work permit. Employers should ensure that the area in the immediate vicinity of the hot work is fully secure. Before starting hot work, an area within at least 10m of the hot work process is cleared of all loose combustible material and if work is to take place on one side of a wall or partition the opposite side is examined to ensure no combustible material will be ignited by conducted heat. Where combustible materials cannot be removed from the area, they are completely protected by non-combustible screens or blankets. Flammable liquids must always removed from the area. It is crucial the hazardous materials are stored in the appropriate manner and in the designated stores to remove the threat of combustion. This is where our new software Chemstore Connect allows for the seamless management of hazardous materials on site. Combustible floors are covered with overlapping sheets of non-combustible material. That the floor is swept clean of combustible materials. That all wall and floor openings, and all gaps in walls and floors through which sparks could pass, are covered with sheets of non-combustible material. This is where Chemstore ensures all our our fire rated walls are designed and certified from one to four hours depending on the legislation associated with the chemical in question on site. Good ventilation is provided in all areas where hot work is being carried out. Where work is above floor level, that non-combustible material is suspended beneath the work to collect sparks. Before carrying out this procedure a risk assessment must be carried out. Employers are legally required to access the risks in the work place and must carry out an assessment of the risks. Safe options should be considered such as should containers be replaced rather than being repaired or using cold cutting or cold repair techniques. 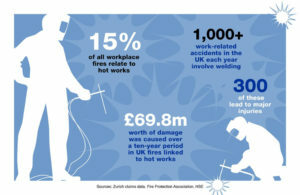 If hot works is necessary, the risks should be avoided by using a specialist company or reduced by using methods such as gas-freeing, cleaning or inerting. A common pain for Environmental Health & Safety Officers is the inability to create a risk assessment report. Chemstore have designed a software called Chemstore Connect which offers our clients access to a seamless software platform where a risk assessment report can be created while on site by using a hand held device such as a tablet. All hot work supervisors and operators must receive hot work training. The training must include the safe practices for hot work, required personal protection equipment and fire extinguishing use. Drums, barrels, tanks or other containers should not be exposed to hot works unless absolutely necessary and the person involved has had the adequate training in the risks involved and the precautions to be taken. Best practices as per the ISO 9001:2015 is to efficiently manage the required training for each employee for risks eg. manual handling. The HR & Training module which can be used on Chemstore Connect enables the user to identify staff training requirements through the use of an online training matrix. The preparation of a tank should be considered as a part of the risk assessment. The appropriate control measures need to be identified and addressed. It is a requirement that tanks must be isolated from other equipment. This can be done by removing pipe sections. If possible disconnect small tanks and then transfer them to a safe environment. Emptying the tank or drum should be emptied by pumping or draining the liquid into a designated container. The residue should then be disposed of in accordance with the environmental requirements. Vapours and other volatile material can be removed by blowing air through the tank a method known as gas-freeing. The vapour concentration should be monitored using a gas detector. Gas-freeing on its own is rarely adequate as most containers will still contain residues. A gas detector may not detect these residues and may be still flammable when come in contact with hot works. Attempting to inspect the inside of a storage container can be an extremely difficult process. Mirrors and torches can be used but any light that is used must be flameproof. Over the last eighteen months Chemstore have been developing a new and innovative software which we are now proud introduce Chemstore Connect. This software is designed to aid Environmental Health & Safety Officers in the management and control of their organisations hazardous materials; improving compliance, lowering costs and reducing risk. This user friendly software is equipped with a suite of modules. The six modules offered include a Document Library, Inventory Management, Risk Management, Site Map, HR & Training and an Inspection & Maintenance module. These modules are designed to provide an organisation with a cost effective management system, control and workflow functionality. Each Chemstore unit is allocated a QR Code which can be scanned remotely through mobile devices. This then allows the user to access all information assosiated with the Chemstore unit instantly. For more information on Hot Works you can contact us by clicking here. You can also download further information on Chemstore by clicking the link below or get in touch to set up a free demonstration.